The Abs Diet for Women promises a weight loss of up to 12 pounds from your stomach in 2 weeks and is guaranteed to leave you with a flat belly in 6 weeks. Is this too good to be true? That all sounds good, and when you take a closer look at what the diet promotes, it seems to be true. 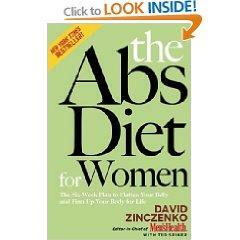 For example, this diet stresses that women should eat. That's a healthy concept that teaches the dieter not to deprive themselves. Not only that, but the diet doesn't recommend calorie counting or measuring food either. Sounds better by the minute, doesn't it? However, if you are a calorie counter and don't want to give it up, the book does include a section for you to know how to count calories on this plan, along with information on how to make the most of every calorie. The old adage, "if it sounds too good to be true, it probably is," doesn't apply to this diet for women. One of the keys to successful weight loss is the Abs Diet Power 12. These are high protein, high fiber foods that leave you feeling full. But that's not the only reason this diet is a success. It also promotes eating often. This includes three meals a day plus snacks around two hours before meals. The author bases his philosophy on what he calls "energy balance," which is supported by research done at Georgia State University. This research shows that the body needs to experience constant energy flow (eating regularly) to be equipped to reduce fat and build muscle. Another unique thing about this diet is that you don't have to buy their brand of diet food, or order prepackaged diet supplements. The power foods can be found at your local grocery and health food stores. Not only that, but they are foods your entire family can enjoy. These foods were chosen for more than one reason. Yes, they are healthy, but each of the foods on the following list has what the diet terms a "superpower". These powers include things like lowering blood pressure. Smoothies are recommended as a delicious snack for before or after you workout, or when you need an after-breakfast boost. They make a fast, easy snack that tastes like a treat. When you stand back and look at the specifics of this diet you can see why it gets results. It's a healthy eating plan and it provides structure for those who need that. It offers a healthy eating plan that doesn't deprive you of all the foods you love, and it also includes an exercise plan. This diet isn't a gimmick, and it doesn't require pills or special supplements; it's just a healthy diet laid out in a way that's easy to follow. If you're ready to get rid of that belly fat, this diet might be just what you're looking for.